I DO have the day completely off, but I’m still going to do some work here at home on the ol’ blog front and around the house because I think I’ve been sitting still for way too long this weekend. I really wanted to take the time to slow down and r e l a x, you know? The weather was beautiful all weekend and although the sun was out, there were slight hints of fall throughout the past couple days. We started out our Saturday by heading to Lincoln Park to visit the Green City Farmer’s Market. Even though I hardly ever buy anything, it’s a fantastic place to stalk other people’s dogs. I didn’t have much success in the petting department, so we decided to walk about a mile and a half north to get pizza at Dimo’s. It had been awhile, so I was all about picking up some of my beloved mac and cheese slices. On our way there, we passed by Aha Crepe, which I had been meaning to go to. They make fancy rolled ice cream and some of the most elaborate crepes I have ever seen. I have to go back for one of those. I was really excited by this ice cream as you can see by my face. We grabbed a few slices of pizza and then headed home. On Friday I stopped into the Nike store because I need to get a more supportive shoe for running sprints on the treadmill. I didn’t buy any yet, but these ones have been stuck in my head because — GOLD. What do you think? Neil and I spent the rest of Saturday watching half the season of Narcos, which just came out on Netflix on Friday. We also slipped in a few episodes of the BBC show Luther with Idris Elba. At first I thought it was meh, but we just finished season two sooooo…. Sunday I had a very important meeting in the West Loop — at Aqua Mermaid School. I was given the opportunity to come and check out their mermaid class and of course I said yes. Little known fact — I was obsessed with The Little Mermaid until I was in college. I had Little Mermaid sheets on my bed the entire time I lived at home and collected any kind of Ariel figurines I could. It may have been a slight problem. I headed to the Six Point Aquatics center and met my friend Sara who also joined me (and can be credited for these pictures). We were given the first couple minutes of class to take pictures while our hair was still dry and to learn the basics of how to put on and use the mermaid tail. The end of the tail is actually two plastic fins fused together in the shape of a tail, which then fits inside the bottom of the fabric. We learned the basics of mermaid swimming: the dolphin kick, swimming on our backs, and side swimming. Once we had those down, we moved on to handstands and front and back flips. 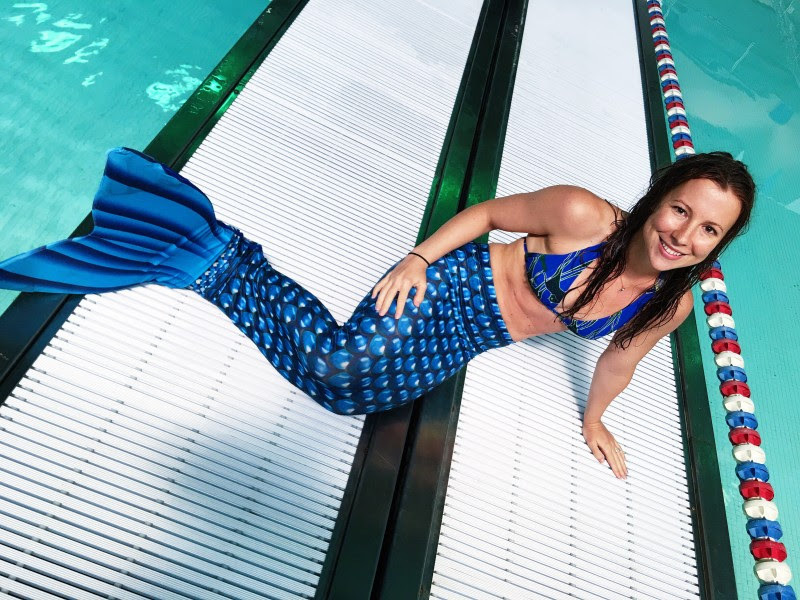 We were given the last part of class to free swim in all our mermaid glory and to take pictures in our tails. Here’s a picture of me side looking to see if I can hop away in my tail without anyone noticing. Overall, I had a great time and it was definitely a fun way to spend my Sunday. 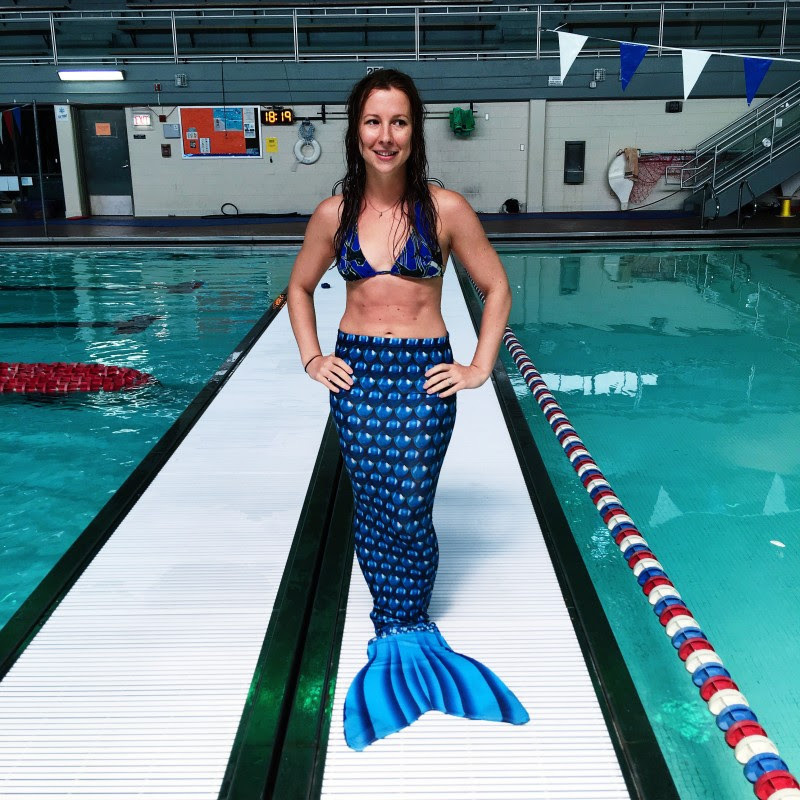 If you’re in Chicago and want to get your mermaid on, head here to read more about it! On the way home I stopped at Whole Foods to grab stuff for sandwiches and also got a lot more than I needed because I was starving after my swim time. Whoops. 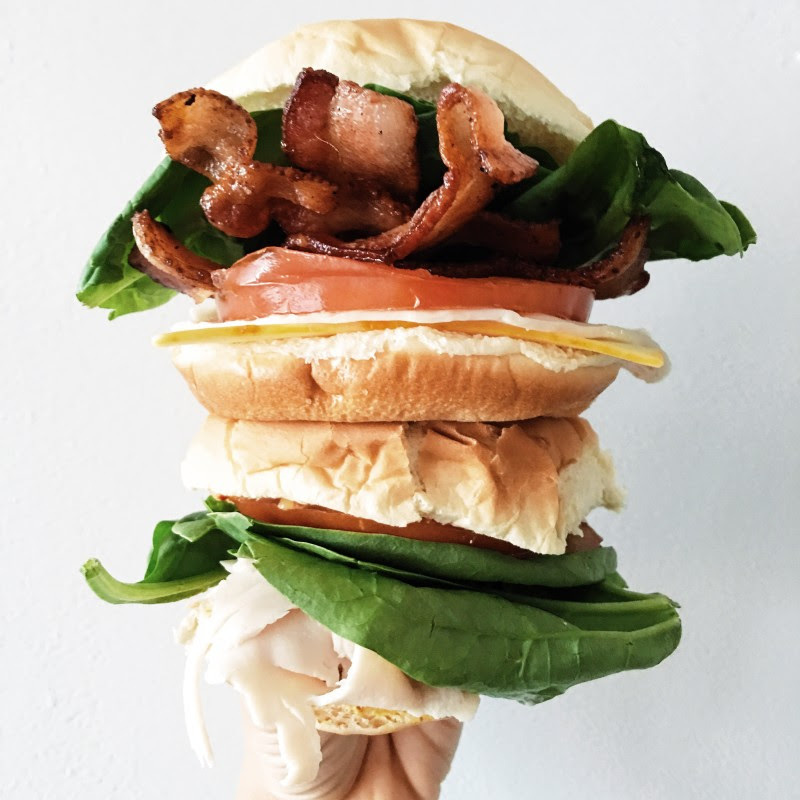 Neil and I had another epic sandwich making evening and finished up Narcos. I’m not sure I liked it as much as the first season, but it was decent. Hope you had a wonderful weekend — let me know how it was! Would you take a mermaid class? I think a mermaid class would be great fun. I’ve pinned several mermaid outfits and makeup tutorials in hopes of motivating me to one day sew a costume for Halloween. There’s still time for this year! oh my gosh, lol so many things! That ice cream looks CRAZY amazing. How creative! And lol you being a mermaid! That is freaking awesome. I definitely played “little mermaid” with my sisters in the pool growing up. 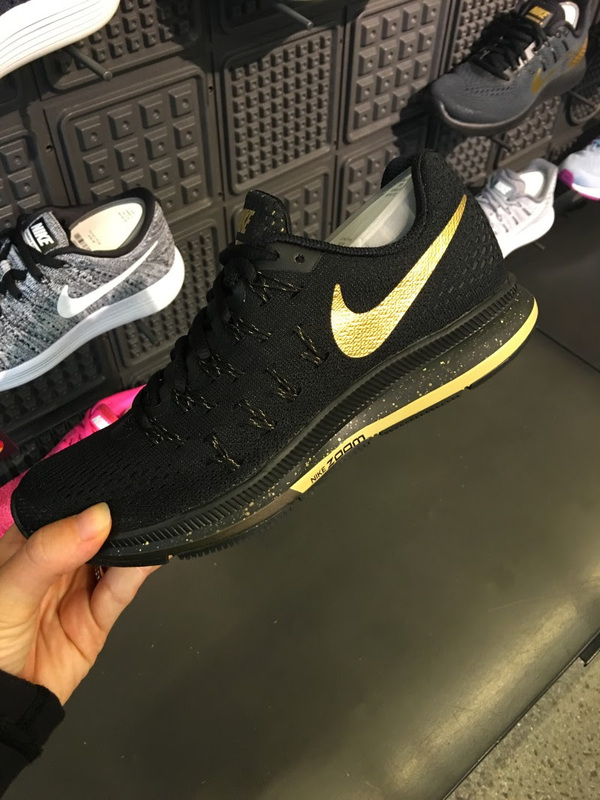 Love the black & gold shoes (but I’m a New Orleans Saints fan so I like all things black & gold). I can only imagine how much fun the mermaid class was. I hope there was lots of Disney singing and I’m impressed you were able to do a handstand with a fin! Oh wow, that mermaid class looks fun and hard! Did it feel like an intense workout? And rolled ice cream sounds delicious; it’s probably hard to make…? It wasn’t too intense bc we spent a lot of time resting and then learning new ways to swim w it on. 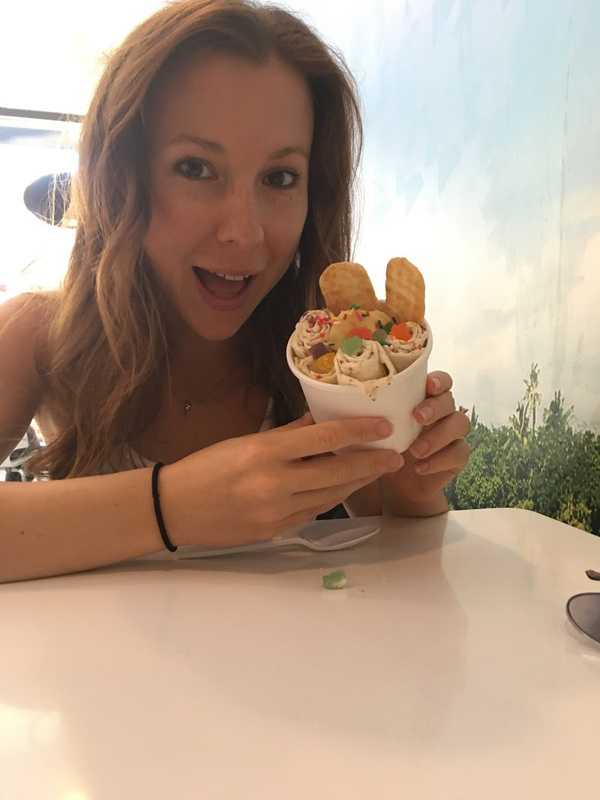 The ice cream was actually really easy – they just poured the cream mixture on an ice cold surface, mixed things in, then as it got cold it turned into ice cream. He flattened it out then rolled it up w a scraper! Heck yes I would take a mermaid class! I’m already hipster Ariel most days of the week …. Haha that’s true. You’d be a natural! 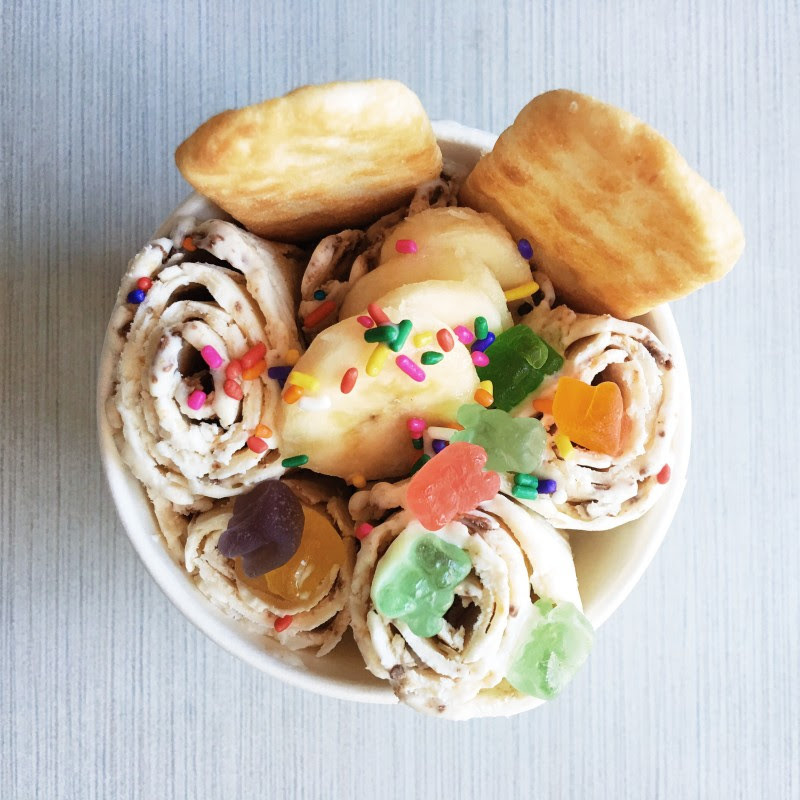 Um I’ve been dying to try rolled ice cream! Also YES get the gold Nikes-so badass looking. ALSO mermaid school?!? How cool is that-love the tail! Me too! I got those Nikes yesterday. ALL THE GOLD. Love those Nike shoes with the gold, BUT i myself just received a pair of Nike Metcons and I’m actually in LOVE with them. They’re so comfortable but sturdy at the same time. I would wear them for sprints on a treadmill for sure. OMG! I wish I knew about this when I was there, it looks so much fun! Love reading your posts girl. I know – I just found out about it too!